In 2005 the Peru School District was compelled by the state to merge with MSAD 21 with the promise that the new combined Dirigo Elementary School would be built in Peru. At the time, knowing that the Peru Elementary School building would be decommissioned in the spring of 2008, Peru citizens formed an ad hoc committee to explore alternative uses for the PES building. Two years later, MSAD 21 consolidated with MSAD’s 43 and 39 to create RSU 10. The ad hoc committee became an official sub committee of the Selectmen and continued to explore possibilities for PES. We surveyed the citizenry and investigated every conceivable repurposing of the old place. We also developed building use forms and price schedules for the many nonprofit organizations that used the building. Our primary hope all along had been to secure a long-term education-based tenant (UMA, RSU 10) to take over the top floor of the building while leaving the bottom floor to be used as a community center. Though the latter use worked out fine, we were unable to secure a big tenant, and in June of 2011 a small but active minority of Peruvians lost patience with us and voted to defund the building. With that shock we ceased to be a subcommittee of the Selectmen and formed a committee we call Friends of Peru Elementary School. FPES elected a board, built a website, a Facebook page, and developed a long list of potential fundraisers. Weeks later, the Gibson Municipal Charitable Program awarded the town of Peru a $10,000 grant with the understanding that it would go to FPES for maintenance of the building as the Peru Community Center. However, at a contentious special town meeting, acceptance of that grant was denied. 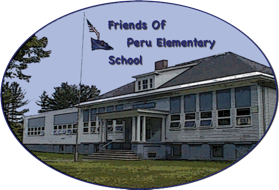 As FPES we began holding fundraisers and attempted, at various public meetings, to promote the civic value of preserving PES and developing it into a Peru Community Center. Our efforts paid off, when, in November, the townspeople voted to lease the building to FPES for a year, rather than tear it down. FPES and the Peru Selectmen worked out a lease, and in early December FPES took over operation of the building. FPES pays no rent but is solely responsible for maintenance, utilities, insurance, etc. •We are exploring the creation of a community kitchen; met with the Department of Agriculture inspector on 2/13—he deemed the building suitable.